The issue here is simple. It is not impossible that Gunns of Corrish exist and could have a sensible claim to be 'Chief' of the Clan Gunn. The issues have not been checked in a court of law. First, to explain. I have an old family tree in my possession. Well, in fact I have one tree twice; one seems to be a 1868 and the other seems to be 1870. But these trees were not handed down my family since the year dot. My father saw them at a Genealogical Society of Victoria exhibition in the mid (possibly late) 1960s and organised to get proper photographs done of them. They have had very little relevance to my family so I am only now starting to look closely at them. Now I know the arguments that the George Gunn of Corrish line basically did not exist, not least because I have just re-read Sinclair and Mark Rugg Gunn on the issue. But the above says (you may not be able to see the little lines which show how the circles are related). I note Mark Rugg Gunn, page 269 for an alternative. Was the Corrish line unfairly excluded by the first Clan Gunn society? This point is covered elsewhere on this site. 5. They have sons Donald and Robert. 6. 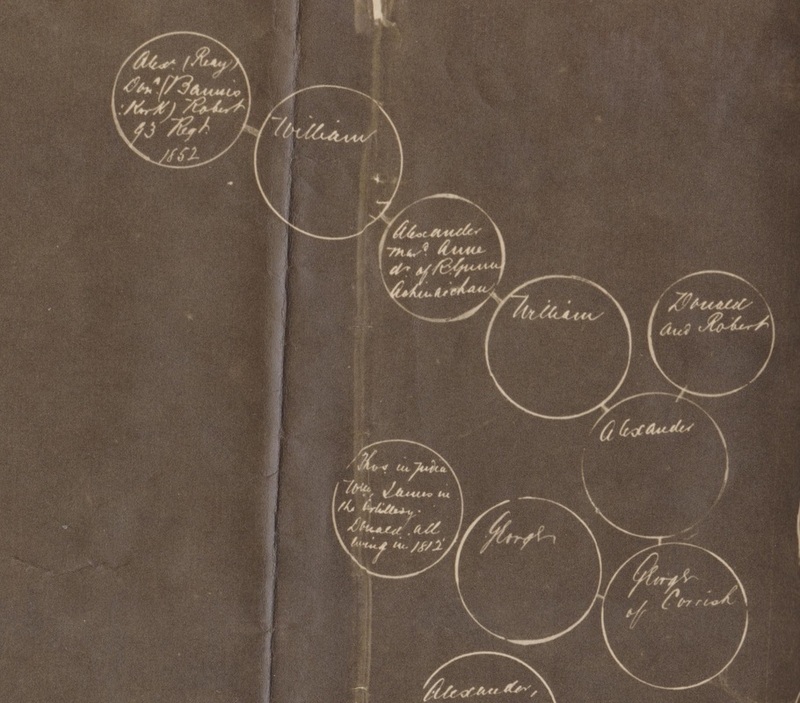 They have another son (he's in the separate circle) William who lived at one time at Airycly ( I think that is now Arichline) afterwards in Newton Watten. 7. 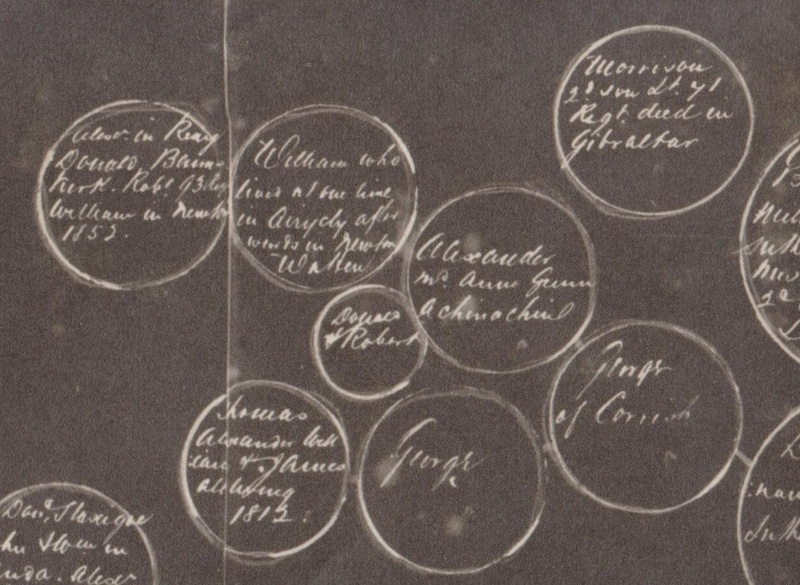 William has sons; Alexander in Reay, Donald in Banniskirk, Robert 93 Regiment, William in Newton 1852. Now, if the Corrish lot exist perhaps they couldn't claim Chief in the old days as they may have been illegitimate, but then again were they? The earliest generations identified are all Gunns with the wives stated as having Gunn maiden surnames. Alexander Gunn, in Kildonan, and his wife Ann Gunn had a son William born at Corrish. The Rev. Alexander Gunn's history also indicates he had sons Donald and Robert. I have been unable to confirm this but naming traditions would suggest that this assertion is likely. The above William married Helen Gunn whose parents were Alexander Gunn and Catherine Gunn. .. The Rev. Alexander had Alexander (New York), John, George, Lewis.